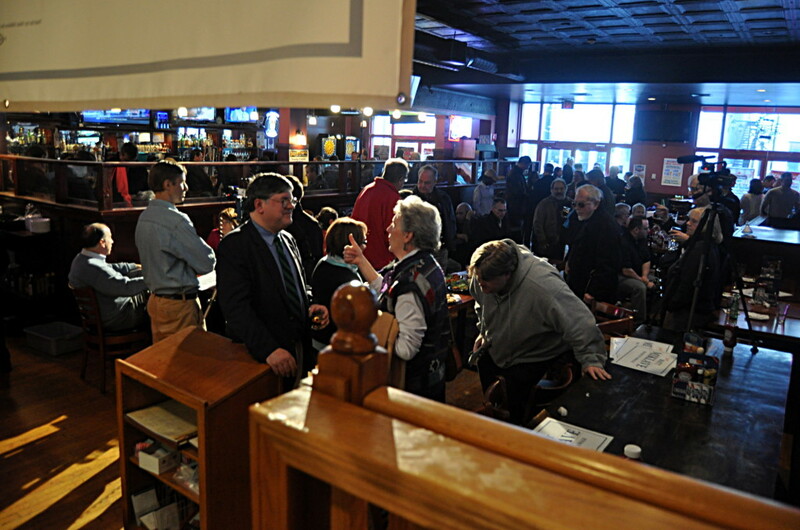 Norwalk Common Councilman Matt Miklave (D-District A) chats with a supporter Saturday after giving his campaign kick off speech at Bradford’s Tavern in SoNo. NORWALK, Conn. – Seeking to build a better Norwalk “brick by brick, block by block, child by child,” Councilman Matt Miklave (D-District D) says he has a plan to raise his profile as he fights to be Norwalk’s next mayor. Miklave is vying to be the Democratic party nominee against former District D Chairman Vinny Mangiacopra, Town Clerk Andy Garfunkel and former Norwalk Police Chief Harry Rilling. Kimmel is a “three-time quitter,” he said, spelling out the councilman’s history of leaving the Democratic caucus in 2002 after losing 14 to 1 to Miklave in the election to be council president; getting elected to the Board of Education and then leaving it; returning to the council only to leave the Democratic caucus again in 2011. 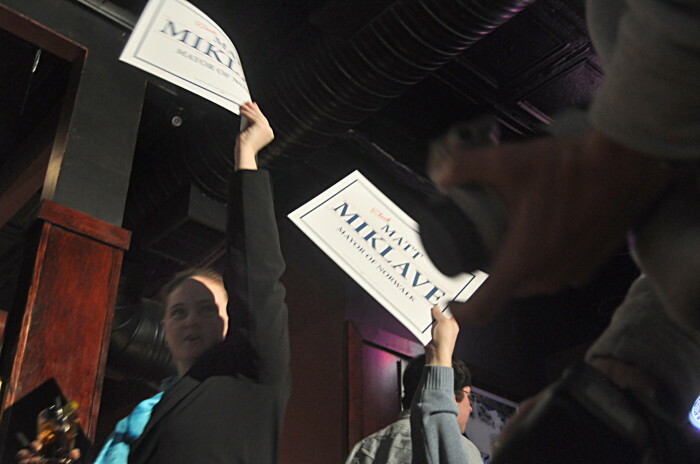 Miklave for Mayor Communications Director Deb Goldstein holds up a campaign sign after Miklave’s speech Saturday at Bradford’s in SoNo. Another knock on Miklave comes from members of the public, who are suspicious of the presence of Norwalk Association of School Administrators President Tony Ditrio as the treasurer of his campaign. “We don’t need a Mayor who, if elected, will owe lots of favors to municipal employee union heads,” said Lwitherspoon in a recent NancyOnNorwalk comment. Correction made, 1:29 p.m., March 25. Why is Kimmel still being called a Democrat when he caucuses with the Republicans ? He defected from the party that elected him, but hasn’t registered as a republican. Obviously, he is now a mugwump, a political animal that sits on the fence with his mug on one side and his wump on the other, unloved by either side. Miklave is not just talking about change, but has suggested a way to make some of that change happen. He’s proposed a program that other municipalities have successfully used to free up money to invest in their city. Nobody else is talking about that. It’s easy to say “no” to everything. It’s much harder to say “yes” and now let’s figure out how we can get it done (and btw, I don’t intend to raise your taxes to do it–we can use the money we already have). Let’s invest in Norwalk and set a new standard for the performance of our representatives and the staff at city hall. Miklave said I was a three time quitter? Let’s see what really happened. Then decide if you would vote for this guy to be mayor. I left the Democratic caucus in 2002 after I was told by Chris Perone that Miklave had organized a faction in the caucus that had been meeting for months at the East Side Cafe; that faction essentially made the work of the caucus a farce — decisions were being made in the faction, and Matt was busy rounding up support for himself to be the next council president, arguing that he was the only person who could stand up to Mayor Knopp, whatever that was supposed to mean. Revealingly, after being elected council president, he became the mayor’s biggest supporter. I announced that I was leaving the caucus before the vote for the next council president. And the vote was not 14-1, since I did not vote. A few more facts are in order. At the end of 2001, it was decided by the Democratic caucus that Joe Mann would be the council president and I would be the majority leader. It was also informally agreed that I would be the next council president. Miklave knew this, so he formed his faction and went to work on his own agenda. I don’t like factionalism, and refused to organize support for myself outside of the caucus via private meetings, phone calls, etc; thus, I briefly left the caucus in anger. I returned to the caucus after many leading Democrats, particularly one form Rowayton who I greatly admired, advised me that Miklave was arguing that I be stripped of my chairmanship of the Finance Committee — apparently, they didn’t trust any other Democrat with that position. Secondly, I stepped down from the BOE because my son had been diagnosed with a serious disease and my wife’s job kept her out of town a lot. I had to step down in order to be home evenings to take care of our son. Miklave knows all this. He, too, would have stepped down under such circumstances. Finally, I never quit the current Democratic caucus because I was never a member of it. I announced two days after the 2011 elections — after I witnessed yet another example of fighting, this time physical, triggered by yet another barrage of race baiting — that I was done participating in the local Democratic organization, including its council caucus, which is pretty much under the thumb of the party’s town committee. That’s zero for three. Not the best way to start a campaign. By the way, last year Miklave supported a 2.8% tax increase that left the BOE with a $5 million reconciliation. But he did this while announcing to a packed concert hall that he would fight to fully fund the BOE. And this year, he slammed the budget process while backing the result. So, last year he was for it before he was against it, and this year he was against it before he was before it. Our next mayor? Miklave’s comments are short on fact, which is not surprising – he often is a stranger to the truth when there are political points to be scared. But what I find downright despicable is that Miklave would label Bruce Kimmel a quitter for stepping down from the Board of Ed to take care of his son. Apparently Miklave will stop at nothing to smear those who oppose his brand of gotcha politics and preening windbaggery. Thank you for asking Mr. Miklave about his ties to unions, and what favors he will owe them if elected. It’s really a shame that Miklave failed to answer the question, apart from some clever misdirection that only serves to remind us of his craven hypocrisy and opportunism. When it comes to making money for himself, Mr. Miklave supports management as a labor lawyer. When it comes to gaining political power, he does everything he can to curry favor with Unions by giving them more of our tax dollars! All Mr. Miklave’s prior efforts to support Union demands with our tax dollars are well documented. Miklave has even gone so far as to condemn projects that he himself voted for, in his efforts to gain the favor of municipal unions. Mayors who are this desperate to gain the favor of unions are the same ones who bankrupt towns with wages and pensions that are unaffordable in the out years. Mr. Miklave’s own campaign finance chief is a Union leader. This raises an obvious conflict of interest. We’ve had enough sophistry – Mr. Miklave should explain to us in clear terms whether or not this Union leader who serves as his campaign’s finance chief will be owed special favors if Mr. Miklave should win election. There are far more of us who respect Bruce Kimmel for doing what he thinks is right, rather than what he is told to do by the Democratic Town Committee. After all, Council members are elected to represent all of Norwalk, not one small and regrettably dysfunctional Town Committee. A candidate who wants to focus on the issues, and all anyone is talking about is the town committee. how sad. Are you Mayor Moccia’s campaign manager or just his PR person ? Are you unable, or just simply unwilling, to respond to the factual content of my comment? To repeat: All Mr. Miklave’s prior efforts to support Union demands with our tax dollars are well documented. Miklave has even gone so far as to condemn projects that he himself voted for, in his efforts to gain the favor of municipal unions. Mayors who are this desperate to gain the favor of unions are the same ones who bankrupt towns with wages and pensions that are unaffordable in the out years. Mr. Miklave’s own campaign finance chief is a Union leader. This raises an obvious conflict of interest. We’ve had enough sophistry – Mr. Miklave should explain to us in clear terms whether or not this Union leader who serves as his campaign’s finance chief will be owed special favors if Mr. Miklave should win election. From Mr. Miklave’s web site, he has served on both sides of the union bargaining table. I’d say that’s pretty good experience to be bringing to the Mayor’s office. It’s actually pretty funny to hear someone accuse him of currying favor with unions, since it’s the other candidates touting union endorsements. Mr Miklave is also on record for accountable transparent government as a way to make the best use of our money (and has been for years).